» Are the Power sector woes coming to an end? We address subscriber queries each and every day. We appreciate the feedback and doubts they send. Their views not only provide great insight into investing behaviour but also shed light on the most prevalent investment myths. I have bought x share, since then the stock has continued to decline. And in order to average out, I have kept on buying more of it. Today I am sitting on loss of Rs 5 lacs. How should I cover up this loss? This wasn't a stock we recommended. But since he got stuck with a heavy loss on the scrip, he wanted to know our views. Now, we do not offer views on stocks we did not recommend. But here was a sell strategy that we felt compelled to reject. Not just for this subscriber but for every reader and investor out there. The selling strategy here is to wait until a stock delivers profits, irrespective of the business' fundamentals. In this process, the investor not only ignores his exposure to a single stock but waits to catch a falling knife. Investors obviously aim to generate maximum returns on every stock. And if the price drops after buying, the buyer at times is keen to average down the buying price. Under the impression of buying cheap, one adds to the position at every dip without taking a fresh look at the fundamentals. 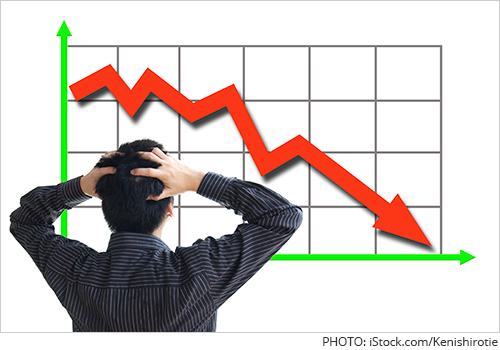 If a stock is on a falling spree, there might be a good reason behind it. And realising that is the first step towards correcting one's investing process. In allocating more resources in a fundamentally weak stock, one is losing the chance to invest in a market leader. This is ignoring the opportunity cost. It would be wiser to consider better options. Warren Buffett's preference to buy stocks on dips is well known. Be greedy when others are fearful, he says. But then he never takes his eyes off the fundamentals. And he also says that the most important thing to do if you find yourself in a hole is to stop digging. Our approach at Equitymaster is to perform due diligence while making a stock recommendation. But if things do not pan out as expected and fundamentals deteriorate, we suggest subscribers to move out of the stock. Again, there are times when a fall in the price is based on factors that have nothing to do with fundamentals. In such cases, averaging could be a good idea as long as one maintains the suggested asset allocation. For example, soon after our StockSelect recommendation in April 2014, many brokerages downgraded the stock. We took a fresh look and were quite convinced about the company's business model and fundamentals. Against the broader trend, we recommended subscribers to buy more, even after the sharp correction. Today, the stock is us almost 33% since our recommendation. In another case, we had recommended subscribers a stock in March 2014 with buy-at-lower-price view. A couple of months later, the stock price touched the suggested buy price. Yet, we did not recommend subscribers to buy. And that was because the decline was driven by management concerns rather than market sentiments. The stock has fallen almost 40% since the initial recommendation. Averaging could certainly be good idea, but not under all circumstances. Gauging the reason for the price decline is the key here. If the reason seems temporary, then one could consider buying more. But if the decline is due to fundamental changes, then pouring money into the same stock would be like catching a falling knife. Selling a stock at the right time is as important as buying it. Else the selling strategy could be the biggest undoing for your portfolio. Bill Bonner and Vivek Kaul, two of the world's most independent thinkers and truth seekers have come together to warn you about a financial crisis. And it is headed straight for India! To find out more about this looming crisis and to get a free copy of Bill Bonner's latest book - Hormegeddon (pay only shipping and handling)... Just click here. Reforms to improve generation capacity, bring down transmission and distribution losses and improve project viability with better tariffs, have been in the works for long. The government has undertaken a slew of reforms for the beleaguered sector of late, the latest being UDAY. All of these, are expected to improve the outlook of the power sector. But the bane of contention all these years was the poor pace of capacity additions in the sector. Capacity addition in the power sector was the highlight of past three 5-year plans. 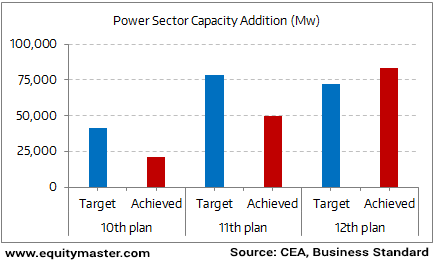 But the sector has missed targets during the tenth and eleventh plan periods, despite them being scaled down. In fact during both the plan periods just 50% and 60% of the targeted capacity addition respectively, were executed. The Twelfth Plan period, however, promises to be different. As per Central Electricity Authority, by March 2017, when the Twelfth Plan ends, capacity addition will hit the mark. The draft Twelfth Five-Year Plan had set a target of adding 100,000 Mw of capacity. But the erstwhile Planning Commission scaled it down to 88,537 Mw. Nevertheless, the capacity increases by private and state thermal�power producers have played a big role. The enhanced thermal power generation is due to improved fuel supply. Coal availability for power projects has hit a historic high and gas supply has also been brought to order through auctions. What remains to be seen is whether the power producers get the advantage of the additional capacity with better tariffs and minimal distribution losses. India's largest spectrum sale ended yesterday within just five days. In 2010, a similar auction went on for more than a month and a 2015 edition lasted 19 days. This gives a sense of the lack of interest and participation in the auctions this time around. The proceeds from the auction are just a fraction of the Rs 5.6 trillion (at base price) of spectrum put up for sale in the auction of 2,354 MHz of radio waves. The government managed to sell just 41% of it. In Budget 2016, the Finance Ministry, had pegged the revenue target from the telecom industry at Rs 989 bn, including upfront receipts of Rs 640 bn from the auction. As against this the actual value of spectrum sold is Rs 657 bn. ICRA had pegged the telecom industry's debt at around Rs 3.8 trillion in December 2015. Falling ARPUs and vulnerable balance sheets are expected to put further pressure on financials of telecom companies. In an issue of The 5 Minute Wrapup, Radhika has explained why the price wars in the telecom sector is expected to leave even the strongest players worse off. A big thank you to Equitymaster readers - your donations are already making a big difference! CanSupport helps cancer patients fight the disease, trauma and pain that comes when a loved one has cancer. There are patients whose cancer is in such an advanced stage that it is not possible to take the patient to hospital all the time. Neither is it affordable to stay in the hospital throughout the treatment. CanSupport understands the crisis that families face in this situation. Their 25 Home Care teams - with a doctor, a nurse and a counsellor visit the patient and their family and provide crucial information and support at this time of need. They provide factual information, necessary equipment where possible, medical advice and counselling and emotional support to help the families deal with the disease. Their work has provided relief and care to patients and families who have no hope. You too can bring hope to the doorstep of a patient suffering from cancer. Sponsor one home visit by CanSupport's Home Care team for just Rs 1,000. Donate now! About CanSupport: CanSupport provides cancer care, pain management, outpatient clinics and daycare centres to poor patients. Their 25 Home Care teams made over 30,000 home visits to patients with cancer in FY'16. Read more about their work here. In the meanwhile, after opening the day on a flat note, Indian share markets are trading lower during the post-noon trading session amid subdued Asian markets. Barring stocks from auto & metal sector, major sectoral indices are trading in the red with stocks from IT, oil & gas sector leading the losses. At the time of writing, The BSE Sensex is trading lower by 95 points (down 0.3%) while the NSE Nifty is trading lower by 31 points (down 0.4%). The BSE Mid Cap index and BSE Small Cap index are both trading flat.